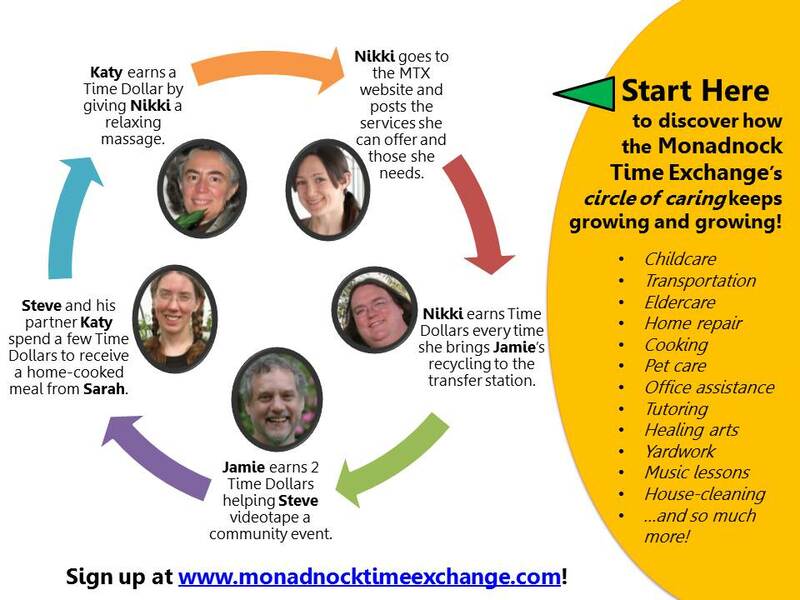 The Monadnock Time Exchange empowers individuals, organizations and businesses to help each other meet their needs cash-free through one-to-one voluntary exchanges and group projects. The concept is pretty simple (even if the background software design is a little complex). Sign up as a member of MTX. Then Help a neighbor to “earn” a time credit for each hour of your service. In exchange, you can “spend” your earned time credits on any of the hundreds of different services that other members offer. You can even go a bit into “debt” to gain needed services. The goal is to promote useful exchanges in our communities to improve our lives. Any questions? If so, contact us at monadnocktimex@gmail.com.